I went to Seattle for a few days. Thank you to those of you who e-mailed to make sure I was okay—it’s nice to know that some of you miss the blog enough to wonder where I am when I don’t post for a few days. I just don’t like to advertise ahead of time that I’m going to be away. And I don’t usually check my e-mail while I am traveling. I had a small moment of panic when I was looking at Facebook Thursday evening; a woman in one of the sewing groups I belong to had posted that “Pacific Fabrics in Seattle is closing!” I later found out that only one of their four locations—the one that is near DD#1’s apartment, actually—was closing. That area is undergoing a lot of upheaval as it’s near the light rail expansion. I don’t know for sure, but I suspect that either their store is being razed to put something else in there or their rent went up beyond what they were willing or able to pay. In any case, the store south of downtown is still there with no plans to close. It’s upstairs in a warehouse, not a fancy storefront, but the space is jam packed with all sorts of goodies. It’s one of those places that when you walk inside, you’re almost breathless for a few minutes while you take it all in. I was reminded of the G Street Fabrics store in Rockville, Maryland. I wandered around looking at everything and then remembered that I needed to stick to my list. I know better than to go into a store like that without a plan. My list included more seatbelt webbing, quilting thread, and wool felt/embroidery supplies. I didn’t necessarily plan to get everything on the list; the list is more to keep me from getting distracted by all the shiny things. 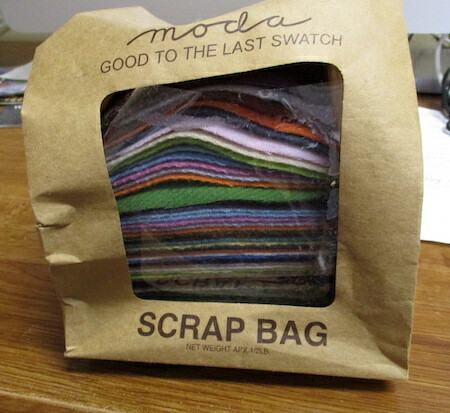 It’s a 1/2 pound bag of wool scraps, perfect for making pennies. This entire bag was $25. Contrast this with the company selling 75 wool pennies—25 of each of three sizes—in a plastic zipper pouch for $25. Can you see why I’d rather buy squares in a plain brown paper bag? (Although the bag, which was none too sturdy to begin with, got a bit more banged up on the trip home.) This will give me plenty to play with. I am hoping to get back again for more shopping in the future. DD#1 and her boyfriend may only be in Seattle for another year, but I think I can make at least one more pilgrimage to Pacific Fabrics before they move. I left Pacific Fabrics, goodies in hand, and wandered around Pike Place market and downtown Seattle for a few hours. I stopped in at Undercover Quilts of America, which (I think) used to be in the actual market itself but has now moved a few blocks away. I know I shopped at a place called Undercover Quilts in the market a few years ago. This is not a big store and they carry mostly batiks. I filed its location for future reference, but I don’t know that I’ll make a special effort to get back there. DD#2 and I met up again after lunch and did a bit more shopping before taking another Uber back to the apartment. We dropped off our purchases and drove up to meet DD#1 and her boyfriend for dinner. One of my favorite places to eat—Sebi’s—is about a 10-minute walk from the apartment. Sebi’s serves eastern European food and it smells exactly like my Grandma Szabo’s kitchen. I had a plate of potato/onion pierogis and some palacinky (Slovak crepes) for dessert. We had breakfast with DD#1 and her boyfriend on Saturday morning and then walked around University Village for a bit and did more shopping. Because Kalispell is something of a fashion wasteland (and my chickens do not care what I am wearing), I like to visit stores in major cities to see what is trending. Wide-legged cropped pants are big for this spring and summer. More so on this trip than on past trips, I was struck by the vast cultural differences between major metropolitan areas and the rural area where I live. It seems that people who live in big cities tend to believe that everyone lives the same kind of lifestyle they do. I suspect that there is more travel in the direction of people from rural areas going to big cities than the other way around. (I am perfectly comfortable getting around on public transportation, for instance, but people who go from cities to rural areas sometimes don’t understand that public transportation just doesn’t exist here.) I wish there was a bit more willingness on the part of people who live on “the coasts” to accept that not everyone thinks the way they do, or believes that things need to be a certain way to be correct. I get especially annoyed with people who get on their moral high horses and assume that people who don’t share their political views must somehow be evil or stupid. I am surrounded by people all over the political spectrum here and when it comes right down to it, we all try to be good human beings and supportive of our neighbors, regardless of political affiliation. This is a hard subject to tease out and elucidate, even more so because I am cognizant of not wanting to live in an echo chamber where the only viewpoints I surround myself with are the ones I like. I joke with the husband sometimes that my liberal friends think I am liberal and my conservative friends think I am conservative, but my friendships with people have a much broader base than just identitarian politics. In any case, this country mouse is glad to be back home. Now we wait for the snow to melt. The forecast is for a high of 59 on Wednesday!